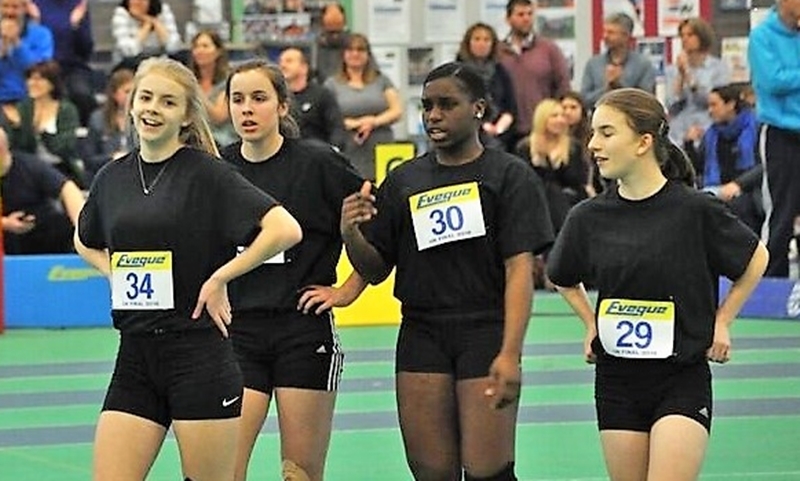 In the regional Final the U13 girls had some team problems, with one athlete unable to go due to injury the week before, it was decided to just go with just 10 girls, but with another not turning up on the day some of the relays were in doubt. Luckily Eve Seery (Thanet AC) who was there to support her brother stepped in to take some of the events. The girls had a good start to the competition coming 2nd in the Obstacle relay. Jess Sargeant (Bexley AC) came 3rd in the Speed Bounce with 82 bounces. Jess Daly (Tonbridge AC) came 5th in the Standing Long Jump 2.22m and Zoe Francis (Swale Combined) came 5th in the 2 lap race. Masie Riddell (Folkestone RR) finished 5th in the 6 lap race. Catlin Taylor (Folkestone RR): Nardia Sadler-Reeves (Ashford AC): Lucy Tallon (Paddock Wood AC) and Ellyah Burke (Folkestone RR) completed the team. The U13 boys won a total of 5 medals with Harvey Fordham (Paddock Wood AC) wining the Standing Triple Jump with 7.36m. Harvey was part of the 4x1 lap relay that came 2nd. Jack Doubtfire (Folkestone RR) came 3rd in the Standing Triple Jump 7.11m and 6th in the 2lap race. Kai Prendergast finished 2nd in the 6 lap time trial and 9th in the Standing Long Jump 2.28m. Kieran Isaac who stepped in at the last minute was 2nd in the Shot 11.16m. Tommy Owler (Folkestone RR) came 2nd in the Vertical Jump 60cm and Daniel Hardy( Medway & Maidstone AC) just missed out on a medal in the Vertical Jump with 57cm and Emmanuel Virginie came 5th in the Speed Bounce with 83 bounces. Prince Gediz came close to the top 5 with 80 bounces. Keenan Simmons (Folkestone RR) Alex Stone (Paddock Wood AC) and Mitchell Kerr (Medway & Maidstone AC) made up the rest of the team. In the U15 boys once again Speed bounce seems to be one of Kent’s strongest events. Nathanial Ryan (Folkestone RR) was = 1st in the Speed Bounce with 87 bounces and Luke Francis (Swale Combined) came = 3rd in the same event with 86. George Seery (Thanet AC) missed out on a medal in the Standing Triple Jump finishing 4th 7.94m.Michael Uzozie (Medway & Maidstone) also came 4th in the 2 lap race losing out on a medal by 0.1 of a second. Eugene Sanger (Folkestone RR) was 6th in the Standing Triple 7.49m. Max Eldridge (Medway & Maidstone AC) was 10th in the same event 7.16m. Adam Garside (Paddock Wood AC) joined the team to make up the 4x2 relay team. George and Eugene ran the 8 lap Paarlauf coming 3rd. George Seery was the highest placed athlete for Kent in the individual competition in 11th place with Michael Uzozie in 12th. The team finished 5th. 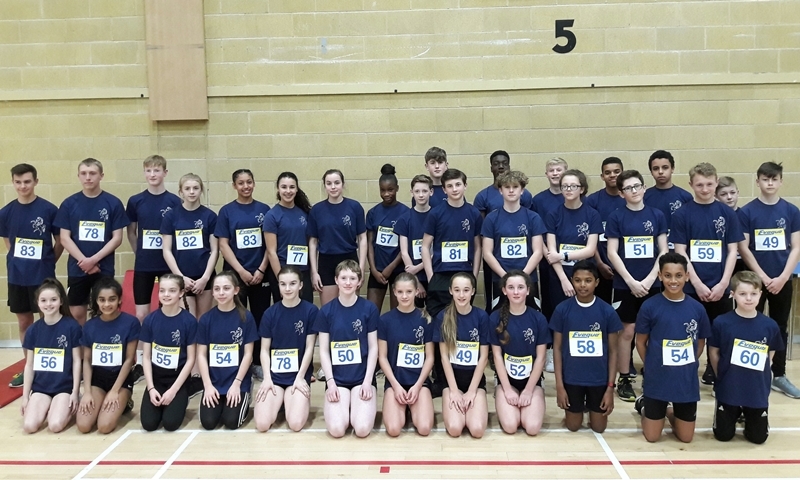 U15 Freya Jury (Swale Combined) won the Speed Bounce with 92 bounces with Sarris Teale (Ashford AC) taking 2nd place 89 bounces. Angel Gediz (Bexley AC) had a good win in the 4 lap race and covered the Standing Long Jump 2.23m and Shot as one athlete did not go. 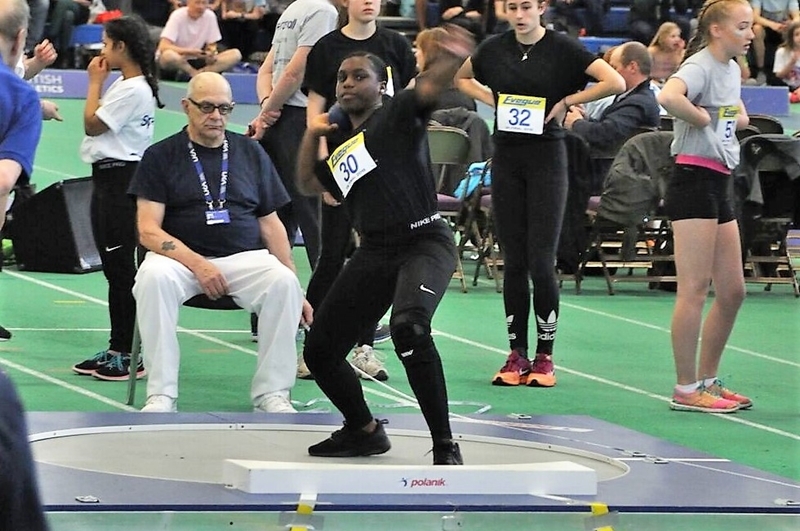 Emily Frimpong (Bexley AC) took 3rd spot in the Vertical Jump 66cm and 4th in the Shot Putt 10.39m. 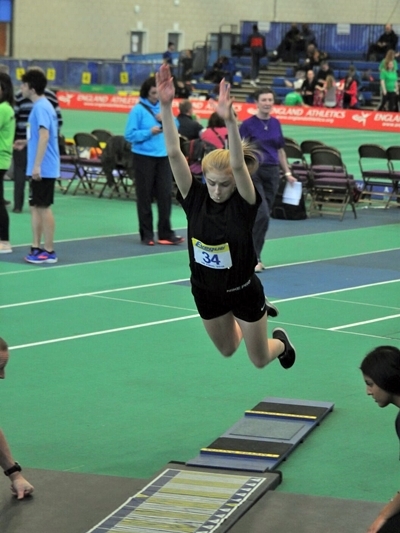 Kimberley Garcia (Paddock Wood AC) came 5th in the Speed Bounce with a PB 82 bounces. 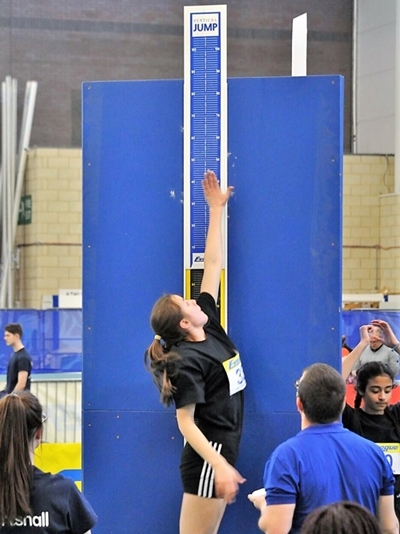 Imogen Davis (Thanet AC) covered the Shot, Vertical jump and 4 lap race. In the all-rounder competition Emily was 4th, Freya 5th, Sarris 7th, and Angel 9th. Kimberley and Imogen were in the top 25, this meant that the Kent team finished 1st and qualified for the UK final in Manchester in April. A total of 12 medals were won on the day, 5 of these won by the U13 boys. 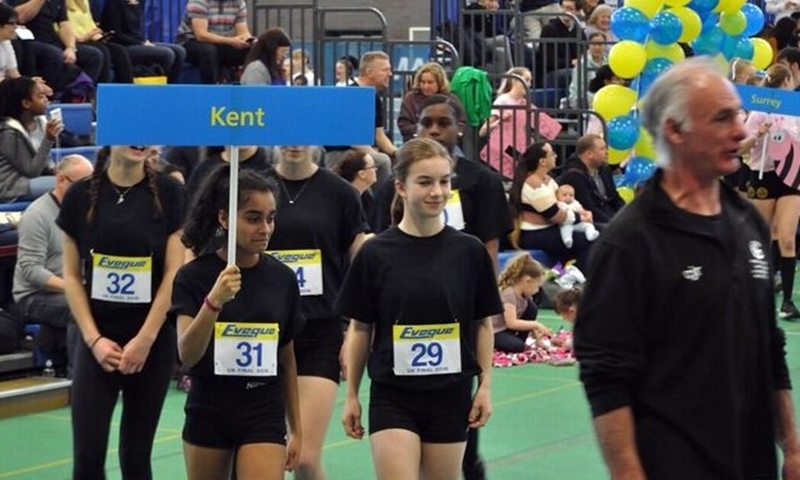 36 athletes took part from 9 clubs across Kent . Parents for getting the children to the venue on a rather snowy day. 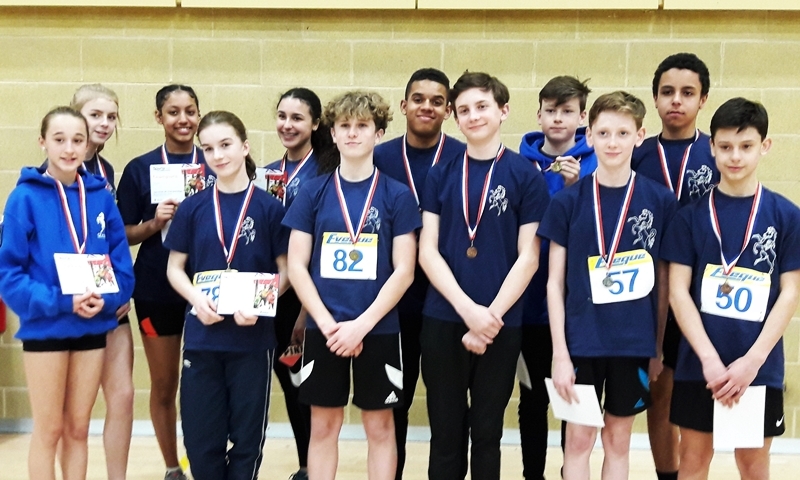 Dina Asher-Smith and Katarina Johnson-Thompson both competed in Sportshall and many other current members of the GB & NI Athletics Teams and Home Country International Teams experienced their first taste of Athletics through Sportshall competition. 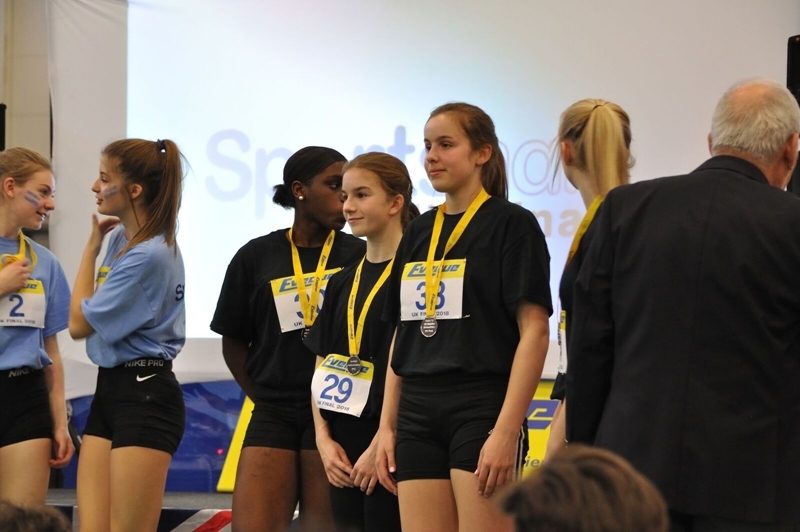 Morgan Lake, High Jump UK Junior record holder, won the Under 15s Sportshall All Rounder competition in 2011 and so this event provides a chance to see the stars of the future at the start of their athletics careers. All three of these international superstars are currently on the Gold Coast in Australia representing England in the Commonwealth Games. Norfolk, Birmingham and Surrey look to be strong contenders in the Under 13 Girls' competition with Kent and Norfolk looking particularly impressive in the Under 15 Girls' team events. Sportshall as a programme was created over 40 years ago and now engages over a million children in athletics each year through club and school games programmes. The event is supported by Eveque Leisure Equipment, Eastland’s Trust and the Amateur Athletic Association. 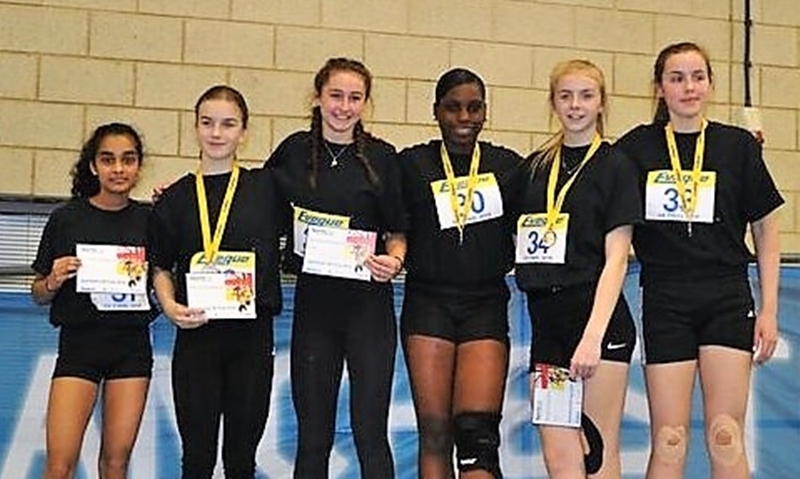 Six girls from Kent travelled to Manchester for the UK final after winning the Regional team event at Burgess Hill in March. Two of the original team members were unable to come so it meant trying to find suitable replacements to fill the team. Joy Kelvin (Bexley AC) who missed the regionals stepped up to do the events she would have done and Ashford’s Libby Turbutt who although U13 and had to pull out of the Kent team at Burgess Hill due to injury was able to fill the other vacant spot, doing some events she would not normally cover. Freya Jury from (Swale Combined) was Kent’s top girl finishing = 5th in the all-Rounder competition. 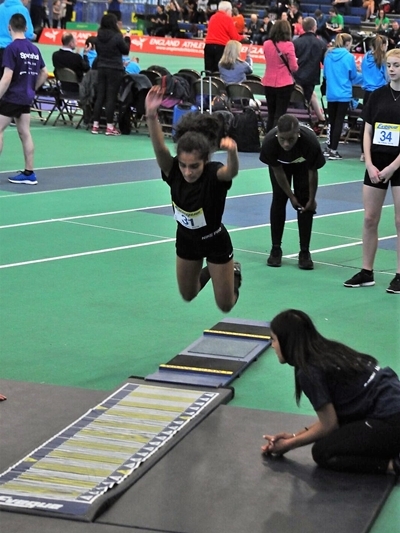 Freya who was the UK U13 Speed Bounce champion last year hope to get the U15 title this year but it was not to be. . Freya finished = 5th in this event with 87 bounces =4th in the Vertical Jump with 56cm and =6th in the 2 lap race. 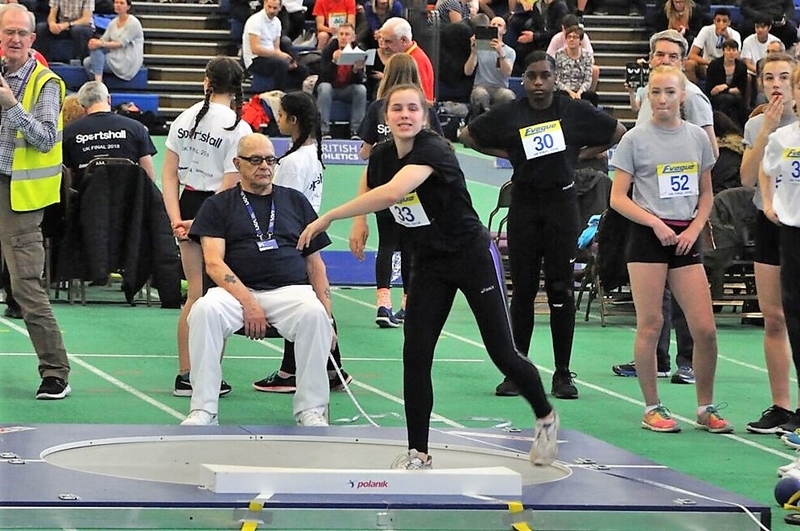 Sarris Teale (Ashford AC) joined Freya in =5th place in the Speed Bounce with 87 bounces, she jumped 2.36m in the Standing Long Jump and came 10th in the 4 lap race. Sarris was 13th overall. Joy Kelvin was 18th overall. Joy Threw a PB in the Shot 9.18m and contested the 2 lap race and the Standing Long Jump 2.30m. Kimberley Garcia (Paddock Wood AC) lost out on a medal in the 2 lap race by 100th of a second finishing 4th. Kimberley ran the 8 lap Paarlauf with Libby Turbutt to finish 5th. Libby covered events she does not normally compete in like Shot and Vertical jump. 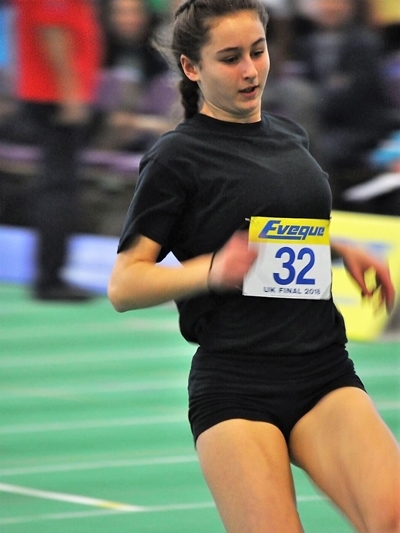 Imogen Davis (Thanet AC) putt a PB in the Shot 9.22m and covered the 4 lap race and 4x2 relay. In the 4x2 relay the Kent team, Davis, Teale, Kelvin and Jury won Silver medals coming = 2nd . The overall performance from the girls was enough to give them 3rd Place in this UK final a great achievement against teams from all round the UK.